On October 1 Hinckley Yacht Services reopened at its former location at Whitehall Marina on Whitehall Creek in Annapolis, MD. General Manager Charlie Petosa reports that they have had a busy winter getting boats winterized and cleaning up and reorganizing the marina. In addition to being a Hinckley dealership, the center will offer a full range of marina services and will develop a unique specialty. “We estimate that there are over 160 jet-powered boats on the Bay, and many of them are here in the Annapolis area. We intend to specialize in service and repair of those jet boats. Also, the industry, as well as Hinckley, is undergoing a rapid switch to large outboard motors as the most popular form of propulsion. We are a Yamaha dealer and service facility and intend to become the best place to have your outboard motor serviced, regardless of make,” Charlie explained. 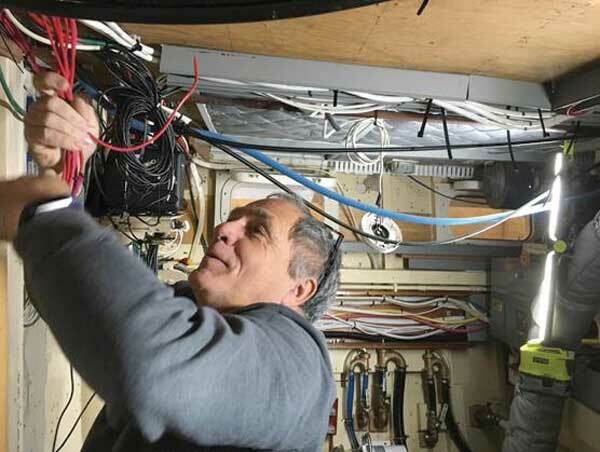 Alex Schlegel of Hartge Yacht Yard in Galesville, MD, brings us up to date on the final stages of rebuilding the 1950 Trumpy motor yacht Manatee, describing the process of bringing a 69-year-old electrical system up to current ABYC standards. “For the last two years we have rebuilt the bottom of a 55-foot Trumpy. Improvements to the interior woodwork are now in progress, along with plumbing and wiring work. There was some rewiring done 20 years ago, but with much of the boat apart it was a good time review it all and make improvements. Re-planking and reframing the bottom revealed parts of the boat that had not been seen since she was built. Guy Dorval rewiring the engine room on Manatee, a 1950 Trumpy at Hartge Yacht Yard in Galesville, MD. “Deteriorated hoses, tubing, and wiring of all voltages were removed or replaced as needed. All wiring previously run under the sole is now in conduits run fore and aft on both hull sides for better access and to keep it out of the bilge. It is not a code requirement, but we are following a good practice of running 110 V and 220 V DC wires in separate bundles and chases from the 12 V and 32 V DC wires. Another consideration in this rewiring is that heat in big bundles of wires can be a problem, so code calls for larger diameter wires in larger bundles. The larger the wire, the easier it is for the electrons to move and, therefore, less heat. We are following the code that requires wires to be supported, either continuously in chases or every 18 inches when not in chases. We are labeling each wire at each end, at the circuit breaker, at terminal strips, and at any junction bars. The color code for DC wiring is red for positive and black for negative. In AC wiring the code is black for positive, white for neutral, and green for ground. Since there are black AC and black DC wires that could be mixed up with a potential for bad things happening, we are using the code options of yellow for DC grounds. This boat uses 12 volts for engine and generator starters, electronics, and LED lights in parts of the boat. The 12 volt batteries for this are in the engine room. “The original D.C. system was 32 volt and much of the equipment is still 32 volts, supplied by two banks of eight-volt batteries located in the lazarette. Cabin lights, windlass, bilge pumps, and navigation lights are on the 32-volt system. There are also 110-volt and 220-volt AC systems onboard. Of note, 220-volt power is used to heat water in a boiler that circulates through radiators in each cabin to keep them warm in chilly weather. For ease of use, and to shorten large battery cable runs, we installed six remote battery switches at the helm that operate 12-volt and 32-volt battery switches at the battery banks. This avoids large wires running to the helm or someone having to go to the switches at the lazarette or engine room. 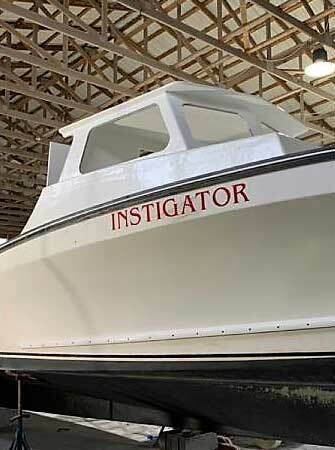 Instigator, a traditional work boat with new fiberglass exterior and a larger “dog house” cabin added at Evans Boat Repairs in Crisfield, MD. 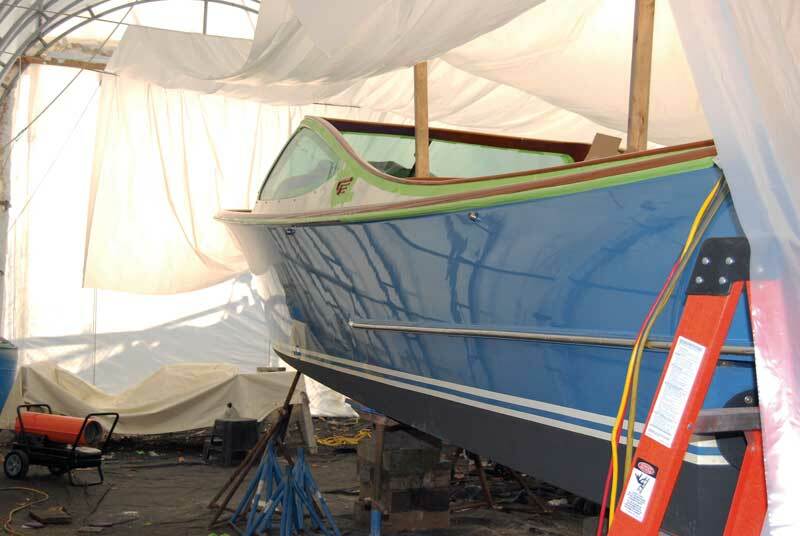 Speaking of plenty of things happening, Rob Hardy of Composite Yacht in Trappe, MD, has five boats under construction. The CY 55 is progressing slowly but surely. Rob says they will have the deck mold on hand shortly. Some design tweaks are being tried out on the hull tunnels. In the meantime construction is complete on the “oven,” a 65- by 20-foot structure where the wet bagged hull will be heat cured. The new resin and materials are all on hand. A CY 26 hull is being laid up with the new materials and will be cured in the oven to make sure everything works as planned. The other new boat is the newly designed CY 46 walkaround designed by Lou Codega to meet Coast Guard inspection requirements. The boat is a walk-around convertible with a 16-foot beam which should be versatile and offshore capable. Planned power is twin 500-horsepower Cummins diesels. 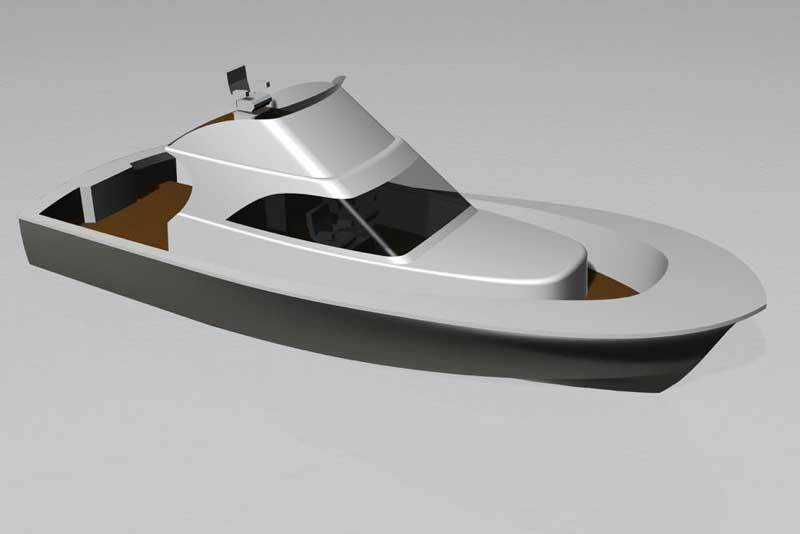 An architect’s rendering of the customized CY 46 under construction at Composite Yacht in Trappe, MD. 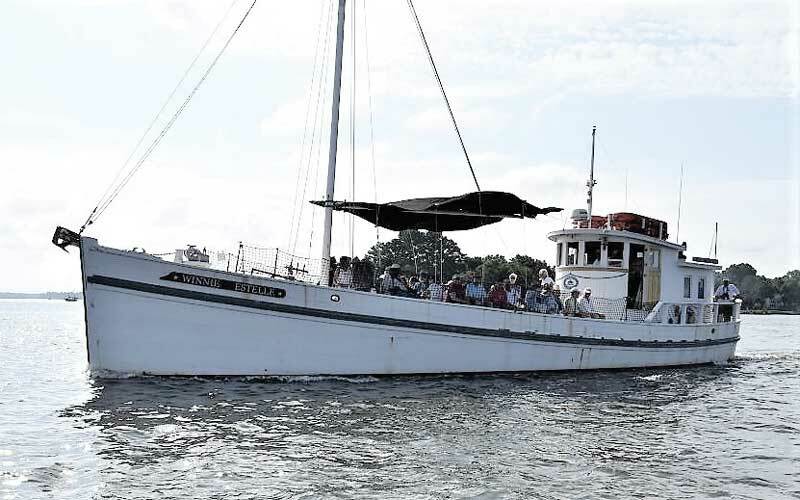 Chesapeake Bay Maritime Museum (CBMM) floating fleet Captain Christian Cabral reports that CBMM’s floating fleet underwent an in-depth winter maintenance program this winter to get the historic vessels ready for spring and summer. The St. Michaels, MD, shipyard prioritized projects onboard the vessels. While working to uphold the highest standards of historical maintenance, CBMM also made efforts to enhance each vessel’s ability to host on-the-water programming. The shipwrights’ first priority was CBMM’s busiest vessel, Winnie Estelle, whose maintenance program included rig, mechanical, and cosmetic projects. The 1920 Buy Boat Winnie Estelle, the busiest boat in the Chesapeake Bay Maritime Museum fleet on the Miles River off St. Michaels, MD. A renewed focus on the fleet as a whole should allow CBMM to offer a greater range of on-the-water experiences with multiple vessels in its floating fleet. CBMM is looking forward to increasing its opportunities for guests to enjoy this unique fleet of operational historic vessels. 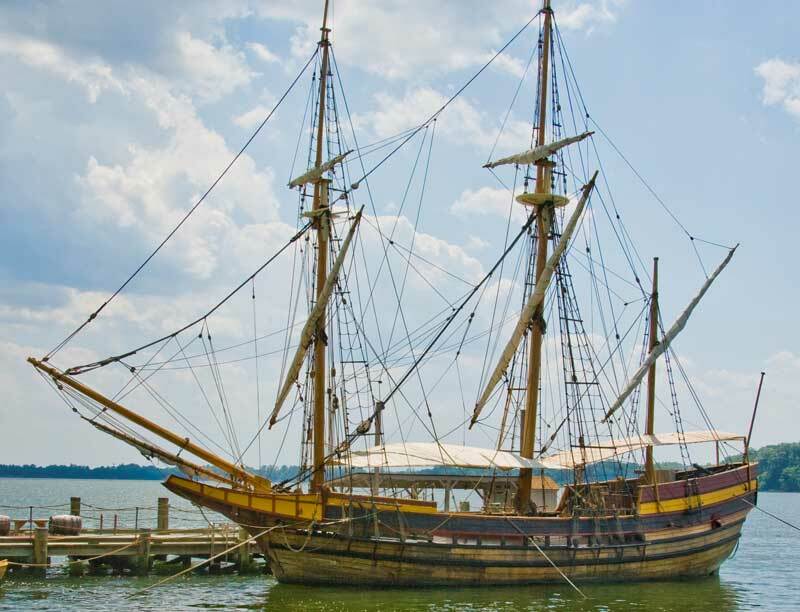 The 1978 replica Maryland Dove docked at historic St. Mary’s City, MD.